Dont knock it, its not done yet. it has about 2 more coats to go and i need to paint the rims and bull gaurds black. not bad for rattle can. and i like it with no trim much better. RED!!!!!! You ruined it. jk. Im a hater of red thats why I say that. Not a bad PJ for rattle can. I like trim on tho! my bug got sun burned! How soon 'till ya drive it? well, my deadline is mid august for a car show. hopefully wayyy sooner than that. whenever the tooth fairy throws me a wad of bills! 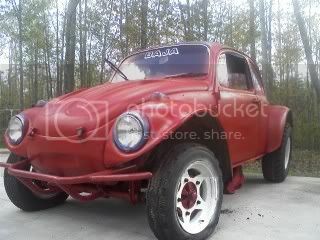 VW Volkswagen & Baja Bug General Discussion No Rust Paint? 4 Bryman042 5083 Re: No Rust Paint?